Hyperopia is one of the most common vision problems. Also known as farsightedness, this condition causes trouble with short-range vision, while distant-range vision remains clear. 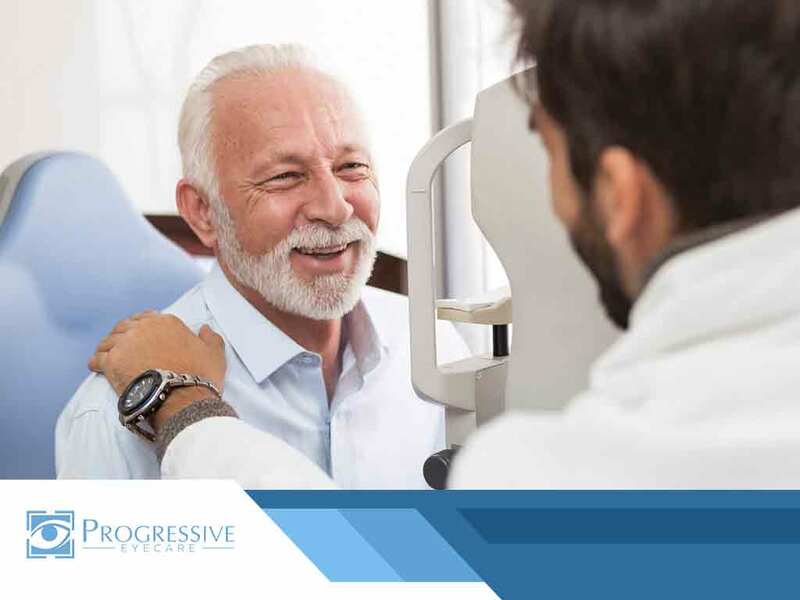 In today’s post, the local eye care specialists of Progressive Eyecare discusses in detail everything you need to know about hyperopia, including causes, symptoms, diagnosis methods and treatment options. To understand hyperopia, you need to understand how vision occurs. Your ability to see is a result of refraction or the bending of light as it passes through one object to another. In this case, the light rays get refracted as they enter the cornea. The refracted light is then focused on the retina, which is located at the back of the eye. It converts the light rays into messages, which are interpreted by the brain via the optic nerve as the images we see. Your optometrist explains that refractive errors are caused by light not being directed properly on the retina. They can be caused by having an irregularly shaped eye, changes in the shape of the cornea or aging of the lenses. Hyperopia is caused by having an eye that’s “shorter” in length than usual or a cornea that is too “flat.” In either case, the refracted light entering the eye goes to the wrong place—behind, rather than on, the retina. That’s what makes nearby objects appear blurry. Farsightedness is often inherited, and typically develops during childhood.Eyeglasses and contact lenses may be prescribed to correct the vision problem. People experiencing moderate levels of hyperopia may exert greater effort and focusing capacity (accommodation) to keep close objects in focus. Eventually, doing so may lead to a wide variety of vision-related problems. Close-range work, such as reading, writing, computer work, etc., can be hard to sustain over longer periods of time, straining the eyes and causing fatigue. Sporadic blurred or double vision may also be experienced, especially when reading or writing. Higher levels of hyperopia may likely occur, which, according to our eye doctor, can contribute to the development of strabismus (crossed eyes) and amblyopia (lazy eyes). Farsightedness is diagnosed through a comprehensive eye exam. The American Optometric Association recommends them for children at six months of age, upon turning three years old, and before they enter first grade. School-children with no pre-existing vision problems should undergo an eye exam every two years. Those who need eyeglasses or contact lens prescriptions must do so annually. Adults ages 18 to 60 should have an eye exam every two years, with annual exams recommended for seniors. Basic eye exams include an assessment of the eyes’ ability to refract light. This helps identify whether the patient has nearsightedness, farsightedness, astigmatism or presbyopia. Various instruments may be used in this part of the exam. The doctor may also ask you to look through several lenses to test your distance and close-up vision capabilities. Retinoscopy is a particular technique done during refraction assessment, in which a retinoscope is used to shine light into your eyes and observe the reflection off your retina. As light is reflected back, the procedure can indicate whether a person has hyperopia. Another technique involves dilating your eyes using drops to make them more sensitive to light for a few hours. Hyperopia is typically treated through corrective eyewear like eyeglasses or contact lenses. In some cases, the eye doctor may recommend refractive surgery such as LASIK. Depending on the degree of hyperopia, you may be prescribed either eyeglasses or contact lenses. These are designed to change the way light is bent into the eyes, compensating for the irregular shape of your cornea or the length of your eyes. Common eyeglasses and contact lenses prescriptions begin with plus numbers, such as %202.50. When you choose eyeglasses as your preferred corrective vision device, you may select aspheric high-index lenses. Often given for those with stronger prescriptions, the lenses tend to be thinner, lighter and have a slimmer profile. Be sure that they include anti-reflective coatings to reduce glare. Alternatively, you can choose contact lenses. They are worn right on your eyes and are available in various materials and types soft contacts and rigid gas permeable contacts. If contact lenses or eyeglasses aren’t good options for you, refractive surgery could be a better solution. LASIK or laser-assisted in situ keratomileusis, is the most common type of refractive surgery. It helps correct farsightedness by adjusting the curvature of the cornea. The procedure doesn’t take that long, and recovery is typically short and easy. Progressive Eyecare is your one-stop shop for excellent eye care, quality eyewear and convenient scheduling. Count on us to deliver top-notch services, from conducting eye exams to treating and managing vision-related conditions. For your yearly eye checkups and eyeglasses or contact lenses prescriptions, give us a call at any of these numbers: (702) 744-8005 in North Las Vegas, (702) 723-4888 in Boca Park or (702) 357-8202 in Southwest Las Vegas. You may also choose to make an appointment. Our Las Vegas service areas include North Las Vegas, Southwest Las Vegas and Summerlin, NV.